A panic attack is characterized by sudden and uncontrollable bouts of anxiety, fear, appearance of shortness of breath, feelings of shortness of breath and pain in the chest and abdomen. Attacks may occur on the background of stress, and without apparent reason. A panic attack may be accompanied by agoraphobia - fear to be in open space among a large number of people. If you are a victim of panic attack, keep in mind that this disease is not dangerous or can cause harm to your health. However, it is impossible, as it can lead to a significant reduction of quality of life. First thing, get yourself together and let out your breath. At the time of panic attacks is the feeling of lack of air. In fact, a person takes deep breaths, and the body is oversaturated with oxygen. And this, in turn, is accompanied by increased anxiety and a feeling of suffocation. Start to breathe correctly. The breathing should be relaxed and uniform. On "two" make an entrance, at the expense of "four". Master the technique of diaphragmatic breathing. Switch your focus. Start to sing to myself some song or count from 1 to 100. Imagine that you are lying on the shore of a sea or ocean and listen to the sound of the surf. The rule is to wear a thin rubber band. Feeling a panic attack approaching, put it on your wrist, pull and let go so that she got snapped on the skin. If possible, hold the palm of your hand in a jet of cold water for 2-3 minutes, then rinse your face and neck. If you are at home, take a contrast shower. Have on hand a sedative herb. Melissa tea perfectly relaxes and calms the nervous system, lime infusion copes with panic attacks. In a glass of tea, add a spoon of honey. Learn to relax. Learn one of the relaxation techniques. If you learn to release muscle tension, you will easily be able to reduce the level of anxiety and fear. Remember that relaxation and fear are opposites, so the muscles to relax during a panic attack can help get rid of stress, anxiety and other negative feelings and to eliminate the attack. If you feel unable to cope with the disease, contact the specialist. 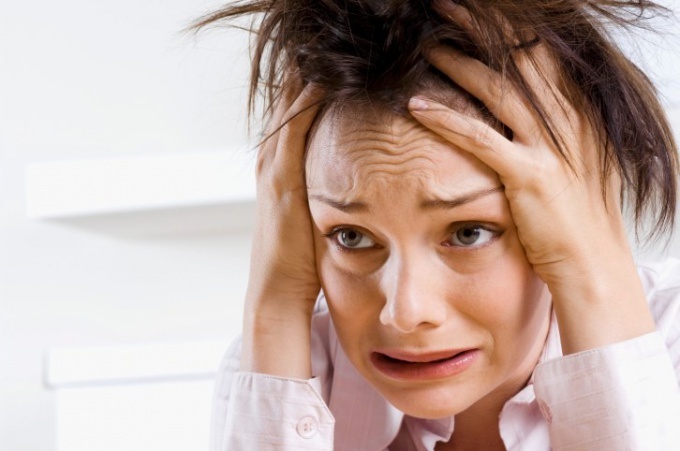 To get rid of panic attacks and to achieve maximum results by using the well-matched therapy. It includes medical treatment (in the beginning) and psychotherapy. If without pills can not do, drink a course of special drugs and go through psychotherapy. Panic attacks are treatable, and the sooner you start treatment the faster you will feel a positive result. Do not self-medicate. Take medicines only as directed by your doctor. The phenomenon of fast reactions to a sudden attack of fear observed in almost every person. However, there are people who regularly panic. This condition is characterized by heart palpitations, shortness of breath, a feeling of inexplicable fear – all these signs talking about what happened a panic attack. "Panic attack" is a term in the world of medicine, and in domestic science it is commonly replaced by the term "vegetative crisis", although in the diagnosis and use the term "attack". Signs of a panic attack are expressed in each patient is very individual, and each time can vary. The most dangerous thing for a person in this state - a sharp increase in blood pressure, which is observed not only in chronic hypertensive patients. The attack usually takes place in the Wake of increased excitability and emotional stress, which leads to a sudden increase in pressure. The patient must in the first minutes of the attack to measure your blood pressure, put him to bed, raising the head, to provide access to fresh air, to drink the drops of sedative effects, for example, Valerian. If the blood pressure exceeds the value of 160\90, you need to immediately call the team "ambulance", which relieves pressure, reducing the risk of hypertensive crisis. During a panic attack the patient should be forbidden to make any sudden movements. All attempts to get up and run somewhere that is peculiar in a panic must be stopped. The patient needs to regularly monitor your blood pressure, to determine whether the increase in the consequence of panic attack or is it a prerequisite for the emergence of hypertension. If the crisis was a consequence of the panic, doctors recommend that within 30 days of taking a mild sedative, it is quite suitable herbal infusions that are not addictive. Repeated attacks usually the person feels, and then, can you prepare them. To reduce the risk of increasing the pressure necessary to open the window (even if it is winter time), lie down, relax and slow on the Trinity score to breathe. The active oxygen oxidant. It reacts with blood cells and nourishes the body, to treat panic attack and not letting the narrowed vessels. At least 6 months will have to give up coffee and green tea, spicy and peppery, to limit the use of fried. Of course, no alcohol. Panic attacks are never fatal and do not pass into chronic mental illness. Man, the first time faced with the manifestations of panic fears, he can't explain his condition, often cannot understand the source of fear, its cause. The excitement of having a panic attack should cause people emotional, unbalanced and those who have suffered severe emotional distress. Usually if an attack passes, and with it stabiliziruemost and pressure for 20-30 minutes after the taken measures, have excitable personalities is born the fear of recurrence. The attack can come back the same day. Diagnosing the patient's state receivei panic attacks, the doctor invites the patient to undergo treatment at the psychotherapist. It is also possible medication.